There have been a few iterations of the Amazon Kindle Paperwhite over the years, but its looks haven’t changed much. That’s been reserved for the more expensive Kindle Oasis, which now comes in a stylish leather case. What is the Kindle Paperwhite and How Does it Work? How Does the Kindle Paperwhite Compare to Similar Products? Instead of focusing on looks, the latest Paperwhite takes a leaf from its predecessor (the Kindle Voyage), prioritizing sharpness of display and user-friendliness over design. Quite incredibly, the Kindle Paperwhite has managed to deliver the same sharp display as its forerunner while maintaining a pocket-friendly price. But is there more to the Kindle Paperwhite, or is it just another cheap addition to the Amazon E-Book reader collection? Read on to find out. The Kindle Paperwhite is part of Amazon’s collection of e-readers. 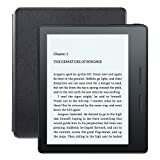 This device allows you to browse, download, buy and read newspapers, e-books, magazines and other forms of digital media through a wireless connection to the Kindle Store. While it strikingly resembles a tablet, it can’t perform tasks that ordinary tabs do. For instance, you cannot use the Kindle Paperwhite to play games or watch videos. However, you can play simple word games online using this e-reader. So, wouldn’t you be better off with a tablet? Not if you are a serial reader. First, tablets cost almost as twice as e-readers. Secondly, the Kindle Paperwhite offers a better reading experience than tablets. Instead of the backlight that is common in LCD tablets, this electronic reader utilizes a transparent light guide to direct light emitted by four edge-mounted Light-Emitting Diodes to the display. This results in a display that allows you to read for a long time without straining your eyes. Before going any further, it is important to note that Paperwhite comes in different versions. Each version has its own price, but the specs are more or less the same. 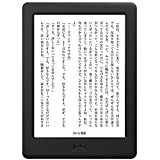 The standard Wifi-only Paperwhite is priced at around a hundred dollars and comes with “Special Offers” (a full-page advertisement that appears on the screen when the Kindle Paperwhite is on sleep mode). The pricing varies for the model that is an ad-free version, which costs higher than the basic one. In this review, ratings are based on the standard model because most users are okay with Wi-Fi-only use and occasional ads. The display of the Kindle Paperwhite is quite similar to that of the Voyage and is one of the standout features of this e-reader. It has a 6-inch Carta E Ink touch display, which boasts of a resolution of 1448 X 1072 and 300 pixels per inch. In simpler terms, the display of this e-reader is nothing short of terrific. What’s more, the glare-free screen allows you to read your e-books anywhere you like, even in direct sunlight. However, the Kindle Paperwhite lacks Voyage’s adaptive backlight, which automatically senses and adjusts brightness accordingly. It also lacks the page turn buttons (present in Voyage) on the right and left bezels. Additionally, the Paperwhite is edged out by the Kindle Oasis in terms of screen brightness, although you won’t have any problem reading in the dark. These are just minor nitpicks though, because you can easily adjust the Paperwhite’s brightness using the on-screen menu. Besides, the touchscreen works just fine as far as turning pages is concerned. The 3G model of the Kindle Paperwhite has dimensions of 6.7 by 4.6 by 0.4 inches (HWD) and weighs only 7.2 ounces. Adding a case will increase its weight and size, but it will still be light and comfortable enough to carry around. The power button, the LED charging indicator, and the power port are all located at the bottom. The headphone jack is a notable absentee because the Kindle Paperwhite doesn’t support audio books. The only design flaw in the Kindle Paperwhite is its lack of waterproof capabilities. It’s not the only Kindle with this flaw, though. Amazon is yet to unveil waterproof kindles, something that competing brands like the Kobo Aura H2O and Kobo Glo HD have already done. Although it would be nice to be able to read from the comfort of your tub or the beach, this shouldn’t be a deal breaker. The Kindle Paperwhite comes with a 1GHz processor and 512MB RAM, which is a significant improvement of the second generation’s 256MB. It uses 3G data on the AT&T network or 2.4GHz 802.11b/g/n Wifi to download reading the material, which you can store in the device’s 4GB internal storage. It doesn’t support external storage, but this shouldn’t be a problem because free cloud storage is available. Using cloud storage allows you to carry your library anywhere using any device that supports the Kindle app. You can also link different accounts together for easy sharing of Kindle books, all thanks to the Family Library Feature. Additionally, there is an all-new ‘About This Book’ feature that shows details of the title you are currently reading, who wrote it, and its position in a series. Another feature of the Kindle Paperwhite is Amazon’s Goodreads. You can access this feature from the “g” icon on the top of your paperwhite’s screen. It allows you to view the books you’ve shelved, follow your friends and see what they are reading, rate books, share passages you’re currently reading and update lists such as the books you’ve read, those to be read in future, and much more. FreeTime is also a worthwhile mention, a feature that allows you to draw up profiles for your kids so as to set their reading goals. This feature also allows you to make the Kindle Paperwhite kid-proof by locking Goodreads, the Web browser, the Kindle Store and Wikipedia. This ensures that your kids don’t access adult content or shop online without your permission. The Kindle Paperwhite has a long-lasting battery. Amazon claims that it can last for weeks on a single charge, but you can only achieve this if you use the device for half an hour per day. Nevertheless, you can read for hours using this Paperwhite without needing a recharge. You should, however, keep in mind that battery life may vary with usage. Charging the Kindle Paperwhite is a pretty straightforward process. Whenever your battery runs low, all you need to do is just plug in the MicroUSB cable into an adapter or PC. If you’ve used any of the previous Paperwhite versions or kindles, you will have no problem using the Kindle Paperwhite. But that doesn’t mean that those with no prior experience with Paperwhites can’t use the Kindle Paperwhite, because it has one of the most user-friendly interfaces you will ever find in an e-reader. When you power on the kindle paperwhite, an icon row appears at top of your screen. On this row, you will find icons for Cart, Home, Brightness, Search, Back, Menu, and Goodreads. Alongside them will be six covers of the reading material stored in the cloud or the internal storage. Toggling between local storage and cloud storage is pretty straightforward – All you have to do is tap on Device or Cloud. Performing operations on books you are currently reading is quite simple. To adjust things like brightness and font or navigate Back, Home, or to a certain page in a book, just tap the area near the top your screen. A row of icons will appear for all the operations you need to customize your reading material, as well as the various navigations. What’s more, the device displays the remaining reading time, which is automatically calculated according to your reading speed. Overall, the reading experience on the kindle paperwhite is more than satisfactory. Flipping through the chapters is easy, and all you have to do is tap the far right or left sides of your screen to proceed forward or revisit the previous page. Also, the screen barely refreshes during reading, and your eyes don’t feel any discomfort. The Kindle store remains at the top of the chain in the ebook space, and it doesn’t seem like this will change any soon. 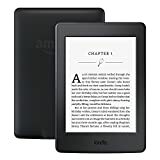 Therefore, Amazon devices such as the Kindle Paperwhite are still the best option as far as access to the best selection of e-books and value for money are concerned. The Amazon Kindle Unlimited service is the equivalent of Netflix for Ebooks, and a monthly subscription grants you access to millions of titles. Besides the proprietary AZW and AZW3 formats, the Kindle Paperwhite supports PDF, TXT, MOBI, HTML, PRC, JPEG, DOC, GIF, DOCX, BMP and PNG file formats. EPUB is notably absent here, and its absence limits your sharing options. This is one of the areas where Kobo and Barnes and Noble edge out Amazon. However, you can still connect the Kindle Paperwhite to a PC or a Mac as a USB mass storage device. This means you can download reading material from other platforms with your PC or Mac and transfer them to the Kindle Paperwhite for easy reading. As far as other E ink-based alternatives go, Kobo Glo HD comes closest to the Kindle Paperwhite. Like the Paperwhite, it offers sharp fonts with high resolution. But unlike Amazon’s Kindle, it’s water resistant. However, it’s priced higher than the Kindle Paperwhite and doesn’t have Amazon’s outstanding e-book Ecosystem. Amazon’s Kindle Oasis is also a serious contender for the brand’s best e-reader. While it delivers the same resolution and a brighter screen, it simply doesn’t offer the same value for money as the Paperwhite. The table below contains comparative data on Kindle Paperwhite and two of its closest competitors. Note: The prices above represent Amazon pricing in the US at the time of review. Prices may vary according to region and time. As you can see, the standard Kindle Paperwhite edges its competitors in terms of sheer value. While it has the lowest price of the bunch, it stacks up nicely to its closest competitors, including the Nook Glowlight Plus, which was specifically designed to compete with the Kindle Paperwhite. The only area where the two competing brands outperform the Kindle Paperwhite is the build quality, and that is only because they are waterproof and the Paperwhite is not. It offers the best value for money compared to competing brands and products. The latest Kindle Paperwhite has better performance and speed than its predecessor. The Kindle Paperwhite has a sharp, bright screen with a higher resolution than most e-readers. Amazon’s Kindle Oasis is the only e-reader with a brighter screen than the kindle paperwhite. It allows you to access the Kindle store, the leading ebook store. Unlike the Voyage, it doesn’t have an adaptive backlight. It lacks water resistance capabilities, something that the Kobo Glo HD and the Nook GlowLight Plus have. It doesn’t support the EPUB file format, limiting your reading options. Despite its limitations, the Kindle Paperwhite remains one of the best e-readers available in today’s market. At this point, the question on your mind should be what generation of Paperwhite you should be using, and not whether the e-reader is a worthwhile purchase. The bottom line is that you should consider sticking to the second generation unless the extra pixels of resolution is a big deal for you. A product review isn’t complete without a rating. On the conventional 5-star rating system, this e-reader is worth a 4-star rating. But you can give this kindle your own rating by giving it a try and sharing what you think in the comments section. We give Kindle Paperwhite a total of 4.7 stars out of 5 because of its great design, performance, and overall experience for the user. It is the better version of its predecessor and offers much more quality to the its readers.